Over-the-knee leg warmers, in classy black and white stripes, would be a lovely edition to any whimsy girl's wardrobe!! A perfect Alice in Wonderland fashion statement that looks fantastic in any season!! You'll enjoying mixing these with colorful dresses, cute vintage rompers, and pumps...Wear them with your Alice costume too!! 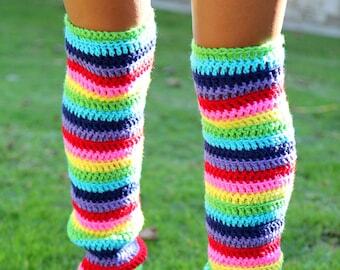 These sensational leg warmers feature a super-soft crochet stripe pattern and are handmade-to-order, just for you.